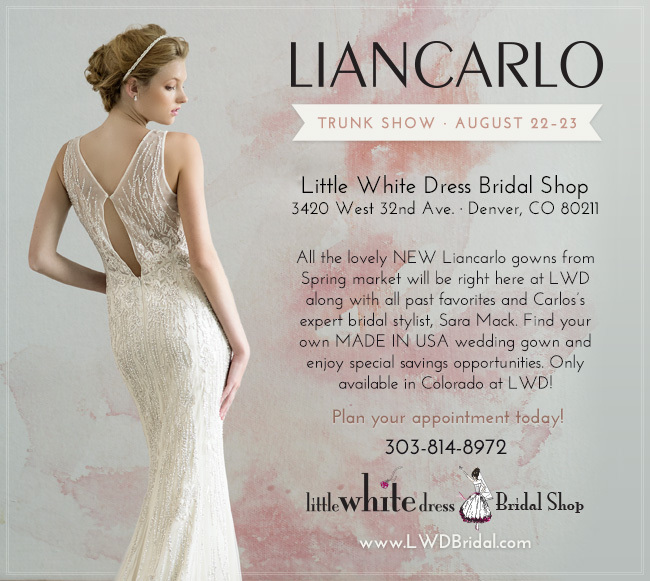 All the lovely NEW Liancarlo gowns from the 2015 collection will be right here at Little White Dress Bridal Shop in Denver, along with all past favorites and Carlos’s expert bridal stylist, Sara Mack. Find your own MADE IN USA wedding gown and enjoy special savings opportunities. These gowns are SO beautiful, and inspired by real Colorado brides and weddings! Only available in Colorado at LWD! Plan your appointment today! 303-814-8972.